This is the last of my blogs for May 2016. 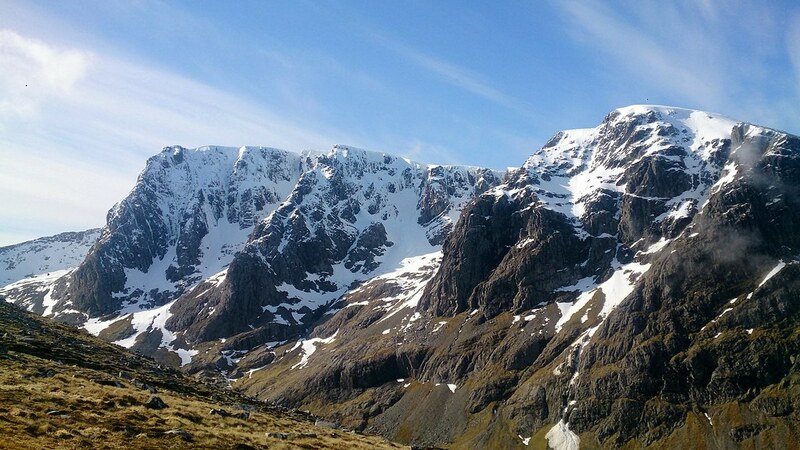 I seem to have been fortunate to have been out in the hills a fair bit this month. 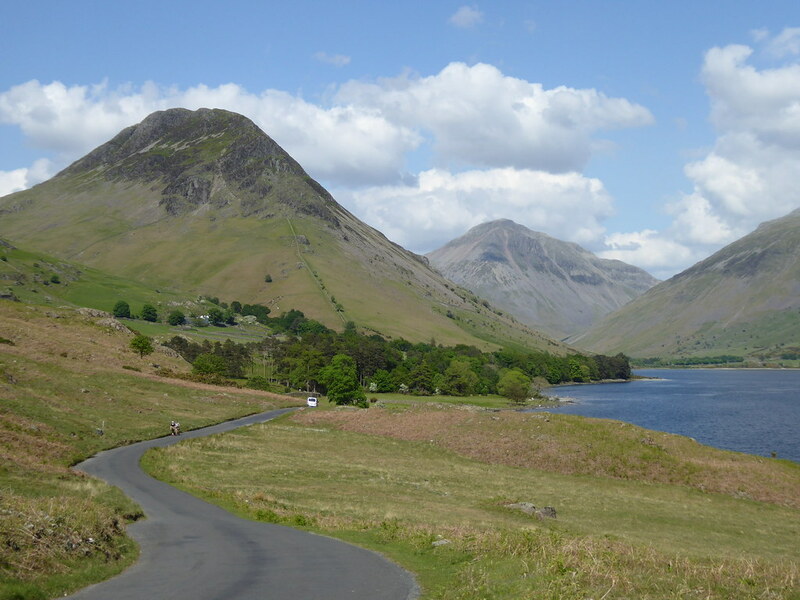 This one covers an iconic hill, a further Marilyn and a good day out by Wastwater. I left home pretty early so as to get around to my start point at Overbeck Bridge by 6.30am. It is a bit of a trek from home to get to this part of the Lakes. 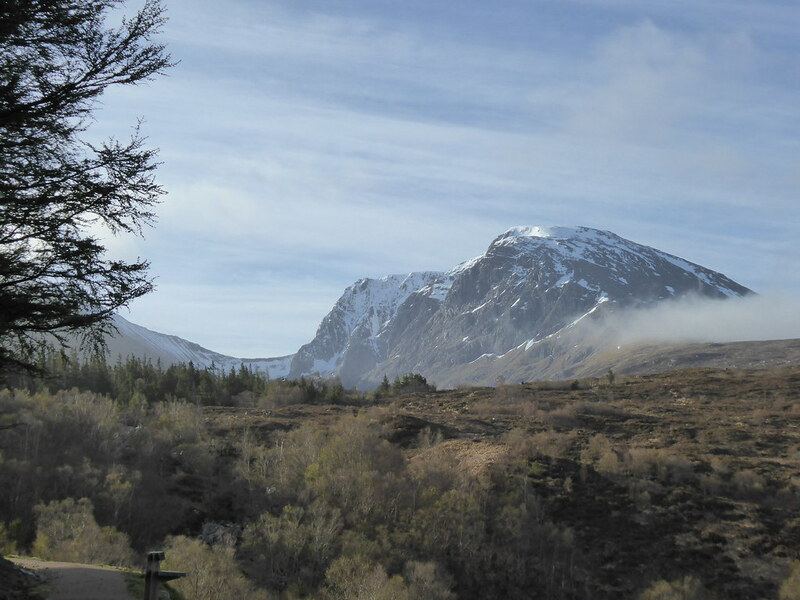 But this was made up for by the scenery on the way round and the promise of a good forecast. 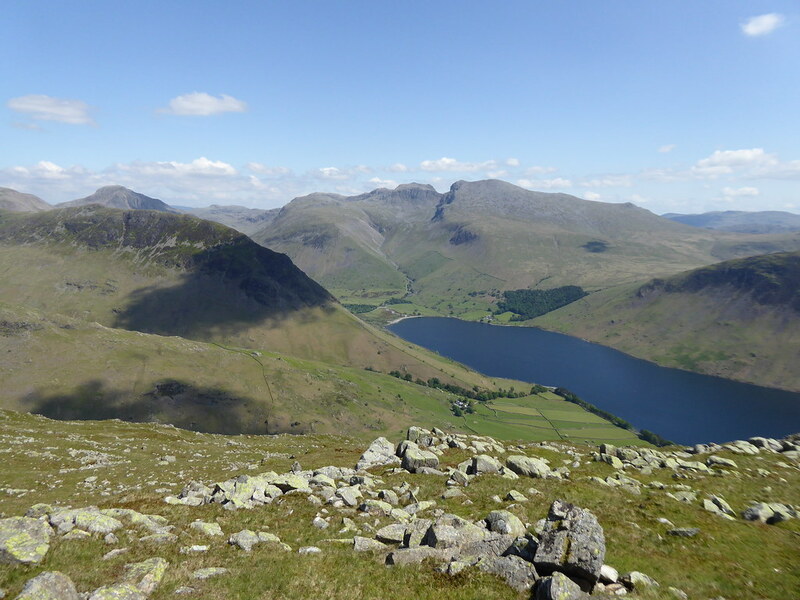 Though the photo below was taken towards the end of the walk, it shows the classic view of Yewbarrow standing proud over Wastwater. 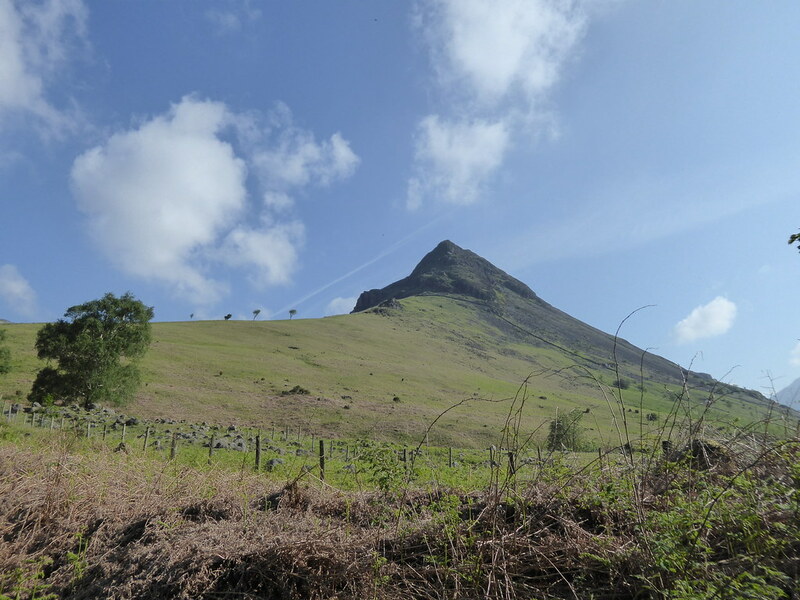 Yewbarrow looks like a pyramid from this angle, but it is actually a long ridge with summits at each end. After a relatively gentle start, it rears up and, if you look for it, provides some easy scrambling through some rock bands. Some I had to help the dog through. But as height was gained, the views became better and better. 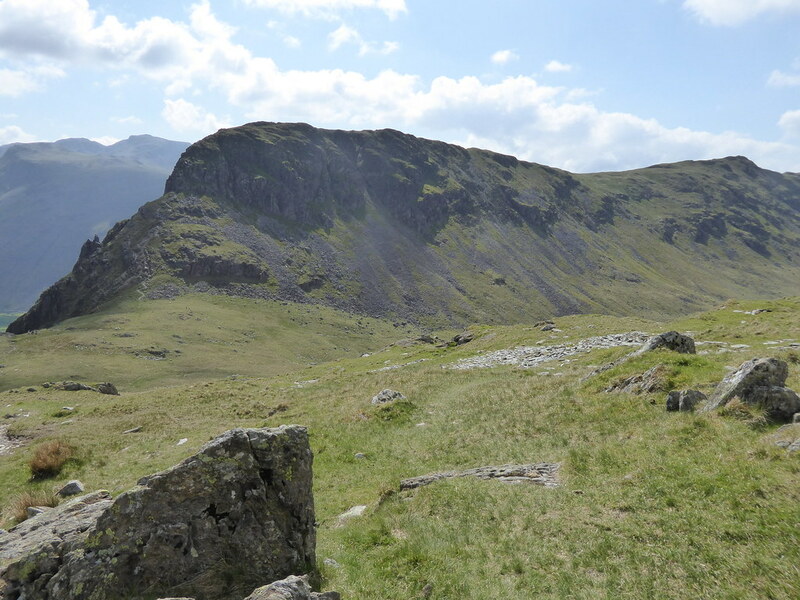 No wonder that Yewbarrow features in Trail Magazine’s top 100 mountain’s of Britain. 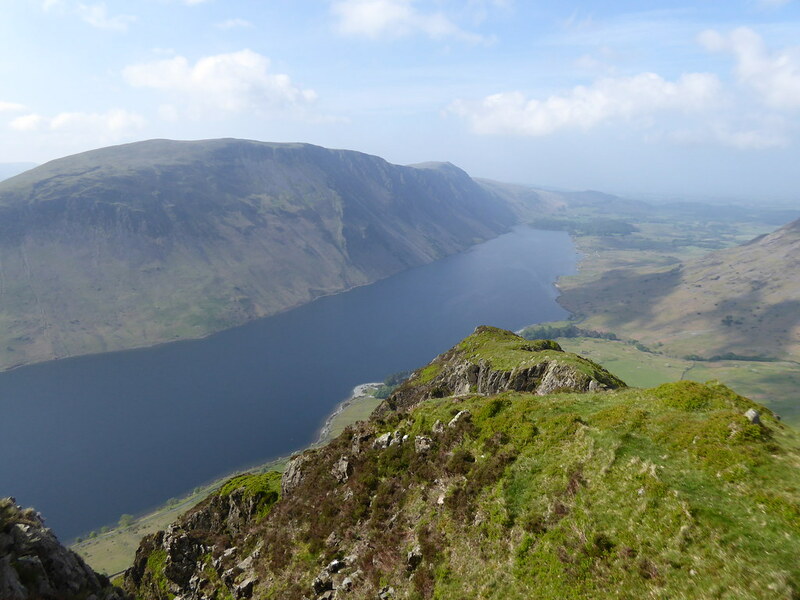 Wastwater stretched away with Illgill Head and its screes on the other side of it. We were soon at the top. 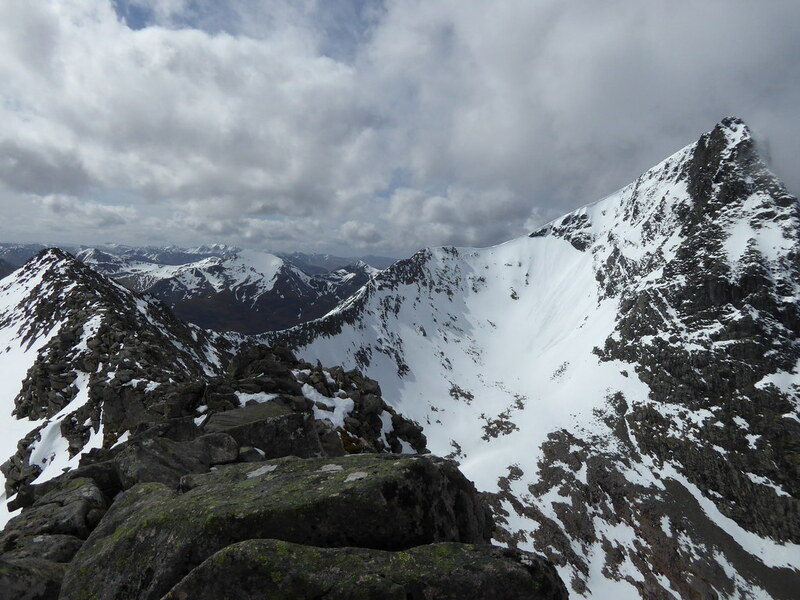 This was the view along the ridge. We were soon joined by a couple who had come along from that direction. 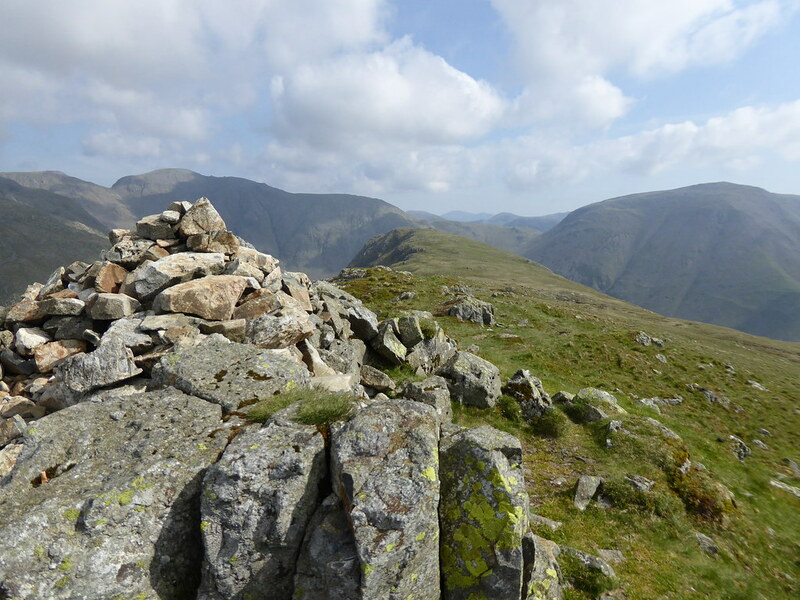 They were nearing the completion of the Wainwrights. 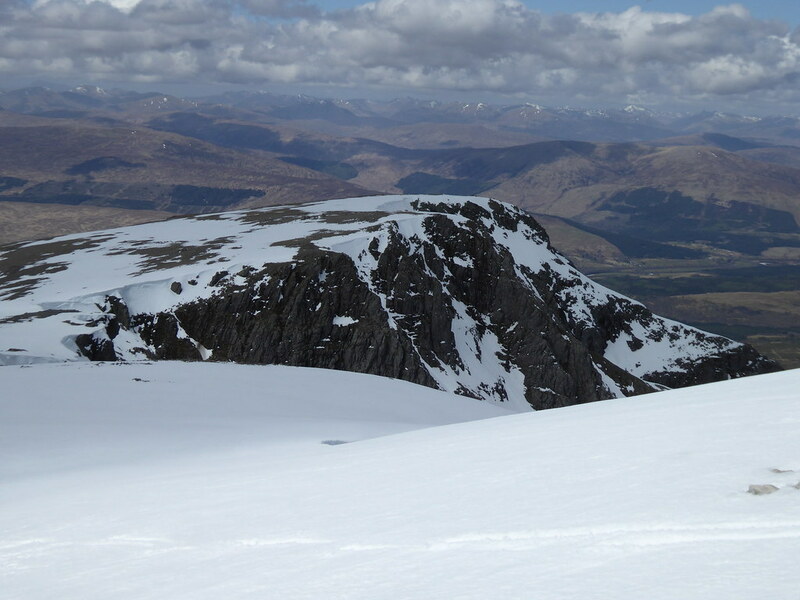 They also warned me of a tricky descent off the far end of the ridge. 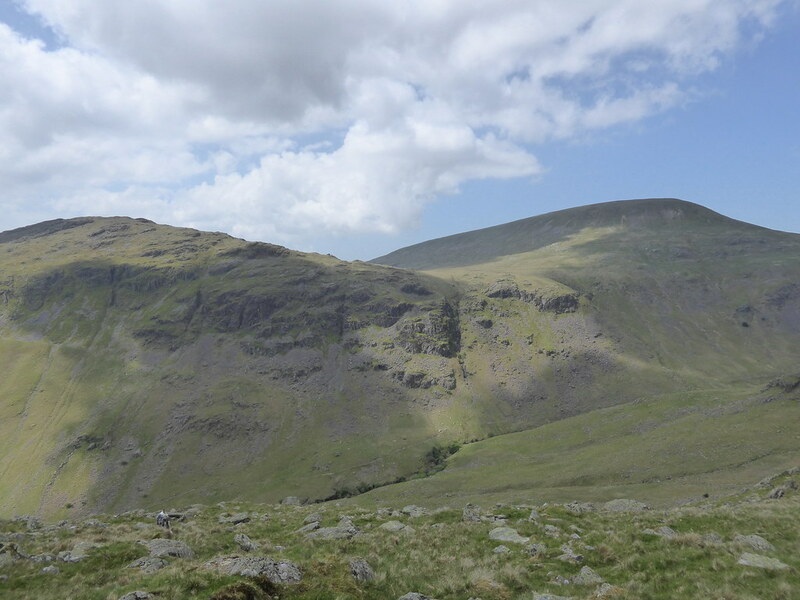 In the meantime we enjoyed the views across to the Scafells before we set off again. 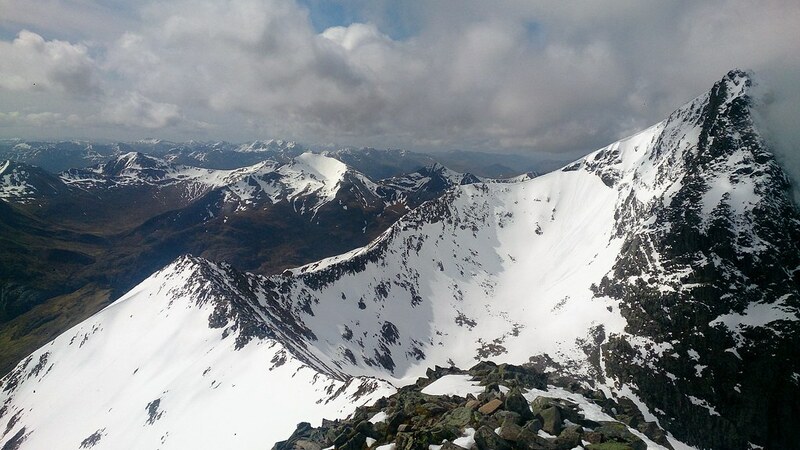 Then this was the view back to the main top. 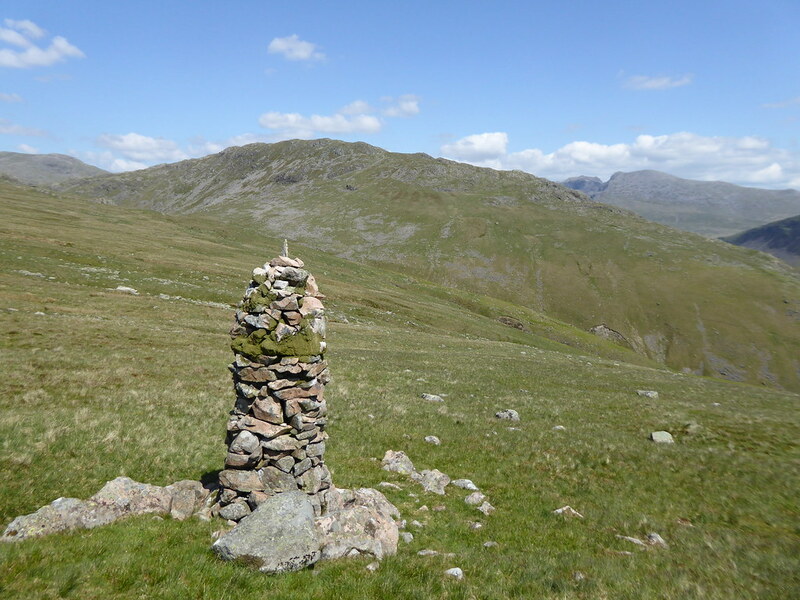 The top at the far end is not at the obvious cairns but at a rock before they are reached. 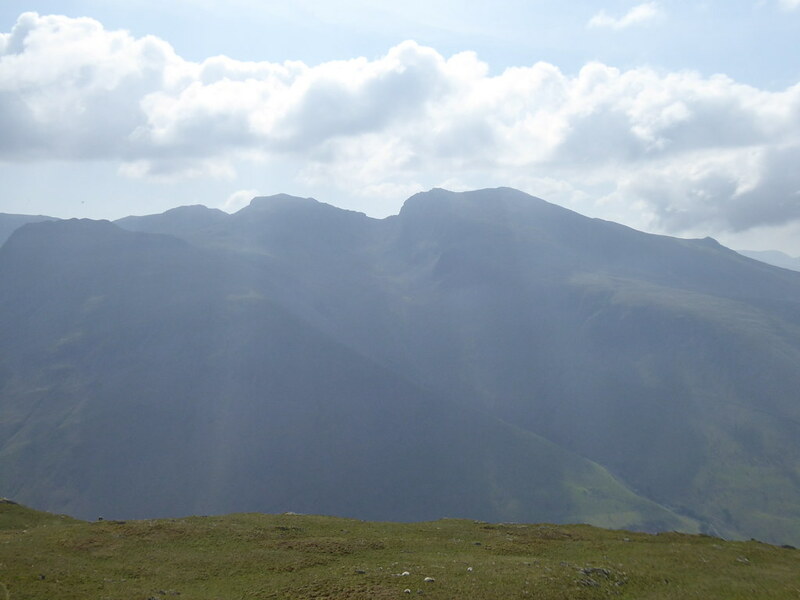 Great Gable stood out to the east. And here is Pillar to the north. So it was time to see what the descent was like. For a (short) while it was OK if steep. Then it became a scramble and I had to guide the dog down, sometimes holding him by the scruff of the neck to ensure he could land safely on some very small landing areas. 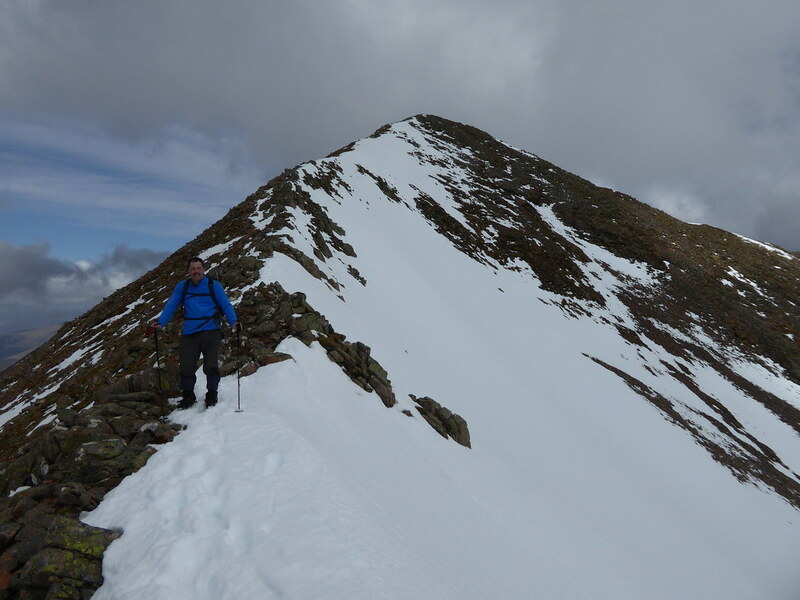 Anyway we made it and the terrain became easier and easier as we approached the col at Dore Head. Here we saw some more people, including a guy who was running and being paced by three others. 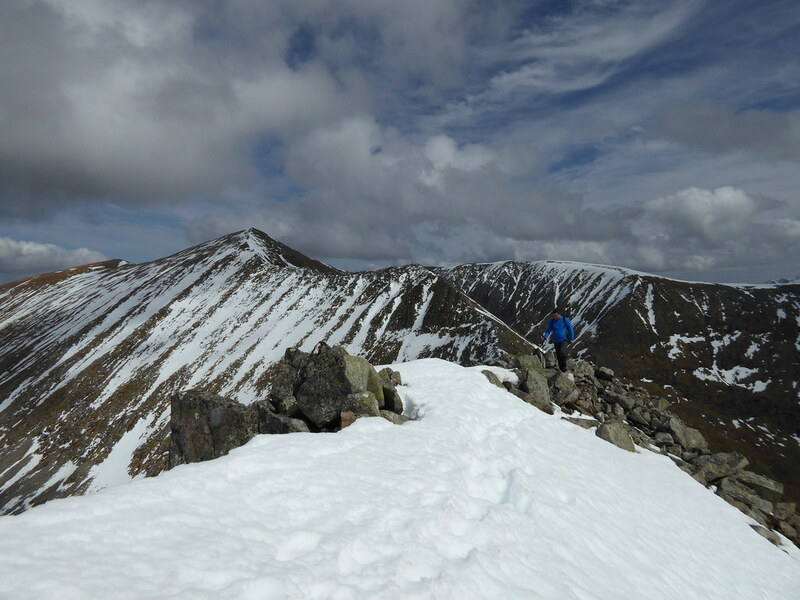 We followed them up the south ridge of Red Pike for 100m (330ft). When the contours relented slightly we broke off in a south westerly direction above Gosforth Crag. Here is Yewbarrow, now behind us. 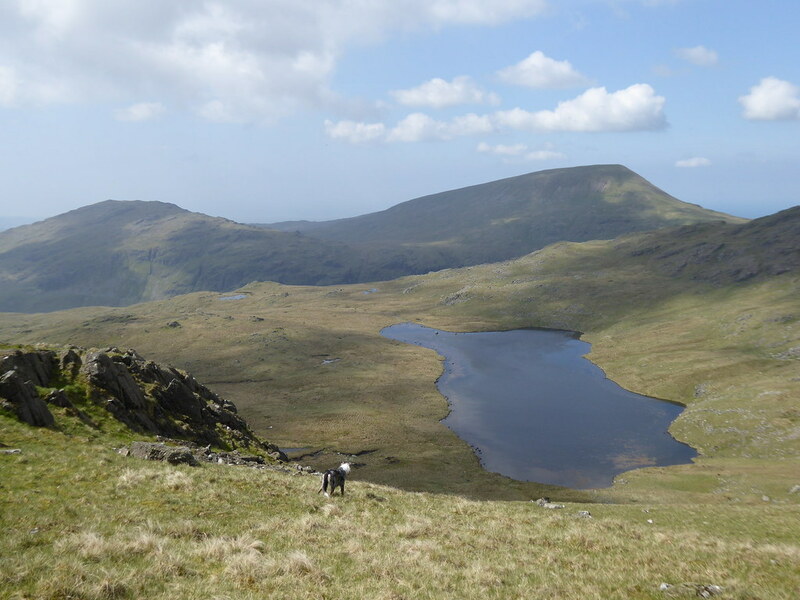 We had 500m of rougher ground before we descended down towards Low Tarn. 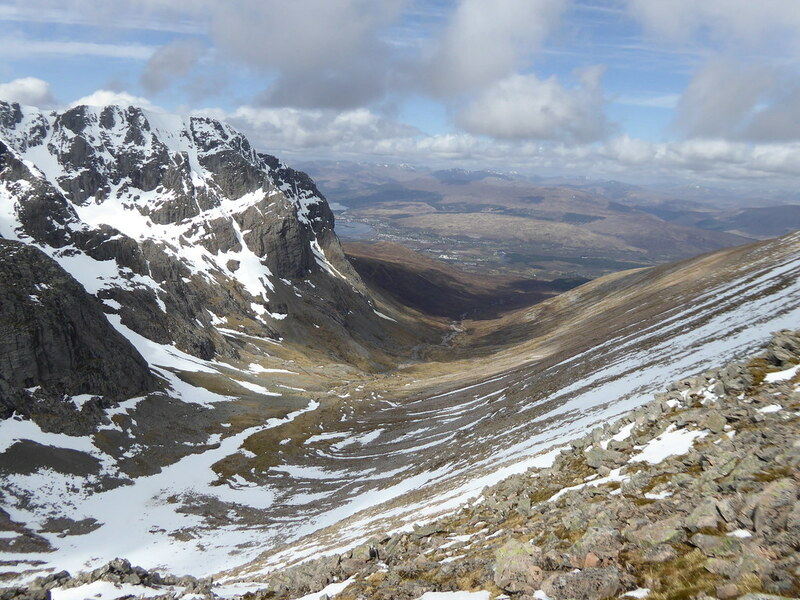 We could now see our next objectives – Seatallan to the right and Middle Fell to the left. 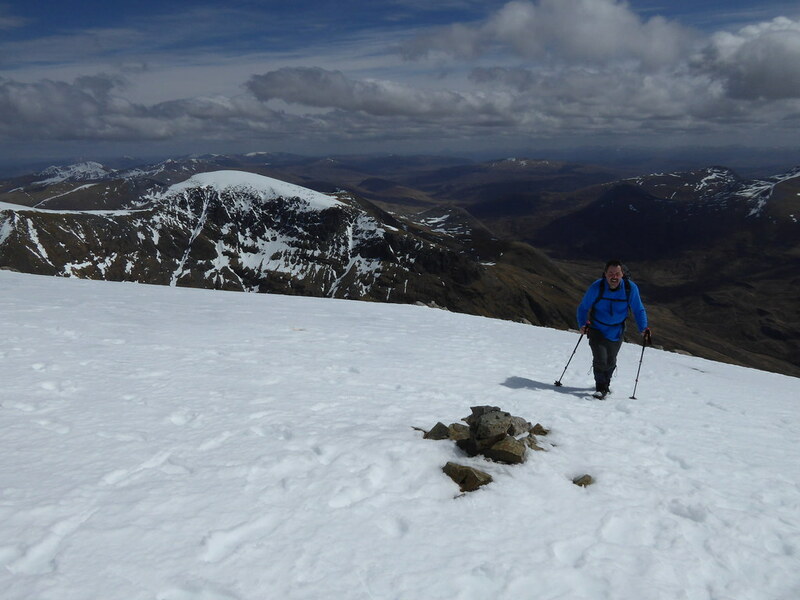 The rough ground continued down to the tarn and along the south side that we continued beside. Towards the far end I found a rock to sit on and to have lunch. 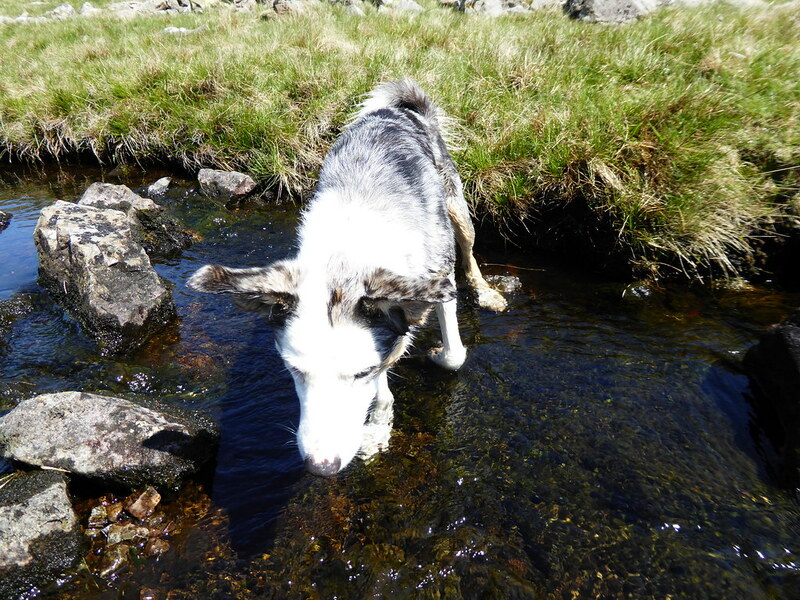 Jet took the opportunity to have a swim. It was warm though tempered with a light chill breeze. Seatallan and Middle Fell were looking closer. After our rest, I took us to the outflow from the tarn and we followed this for a few hundred metres before turning right to cut down towards Nether Gill near its junction with Ash Gill which come down from the dip between Seatallan and Middle Fell. Nether Gill was easy to cross and we crossed the bridleway on the far side and started up the slopes on the true left hand side of Ash Gill. A thigh burning 150m (500ft) of steep grass followed. 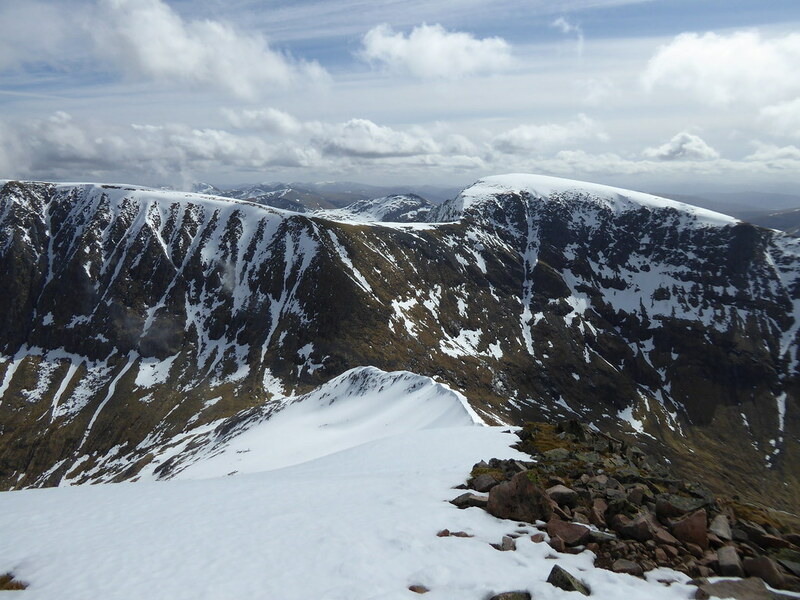 I was glad to reach the broad expanse of the col.
Seatallan was next on the list. 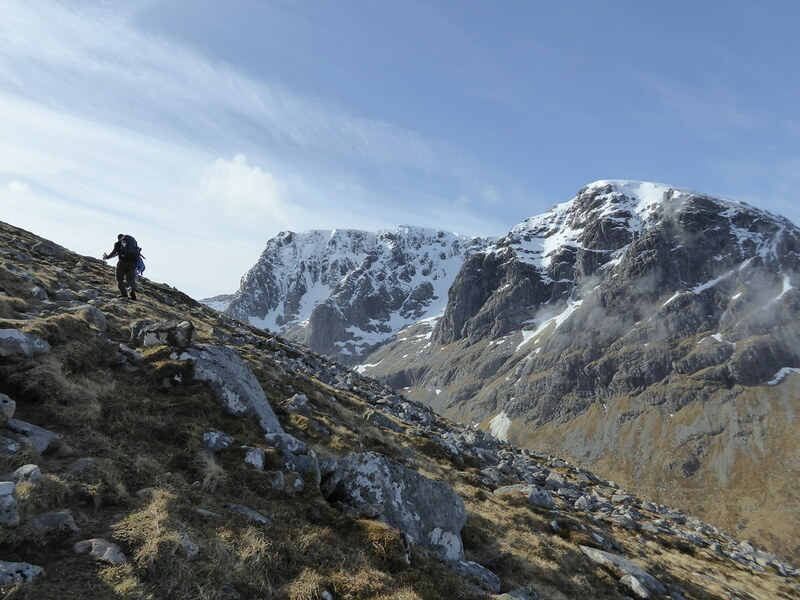 There was no obvious path where I emerged so I continued on a slanting rise almost due west and soon hit a narrow trail that then led straight up and easily to the dome of Seatallan. 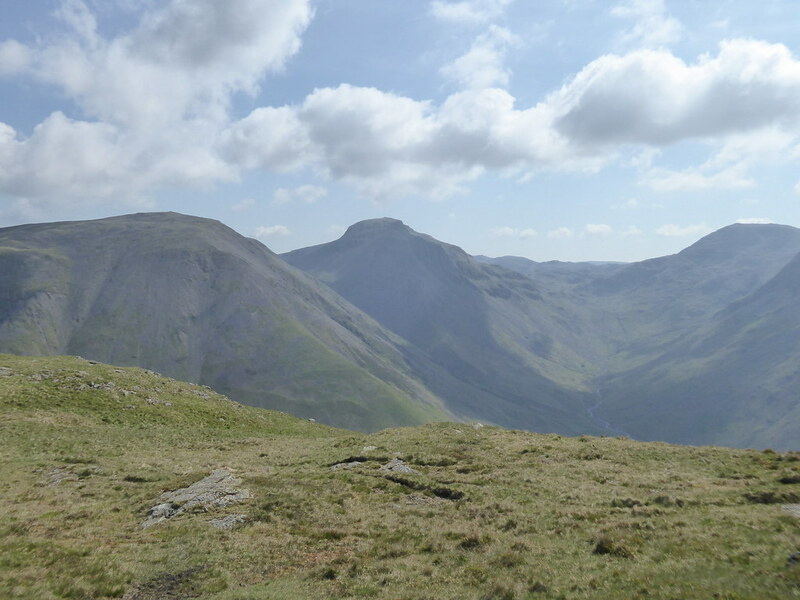 The Scafells and Great Gable were now looking somewhat further away. 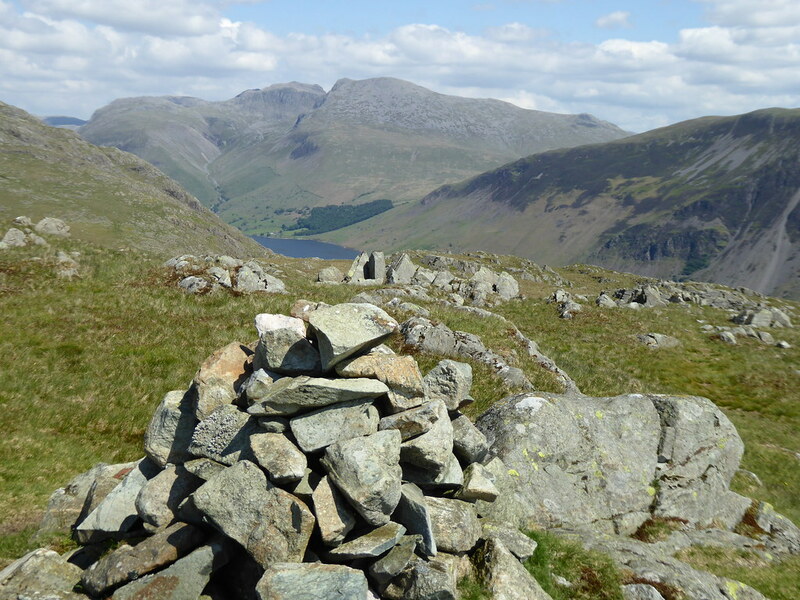 Yewbarrow which can be seen side on in front of the Scafells was now 3km (2 miles) away. Because of the flat area around the trig, the views are less good here. There is also a shelter to keep the weather off. But it remained warm despite the breeze. 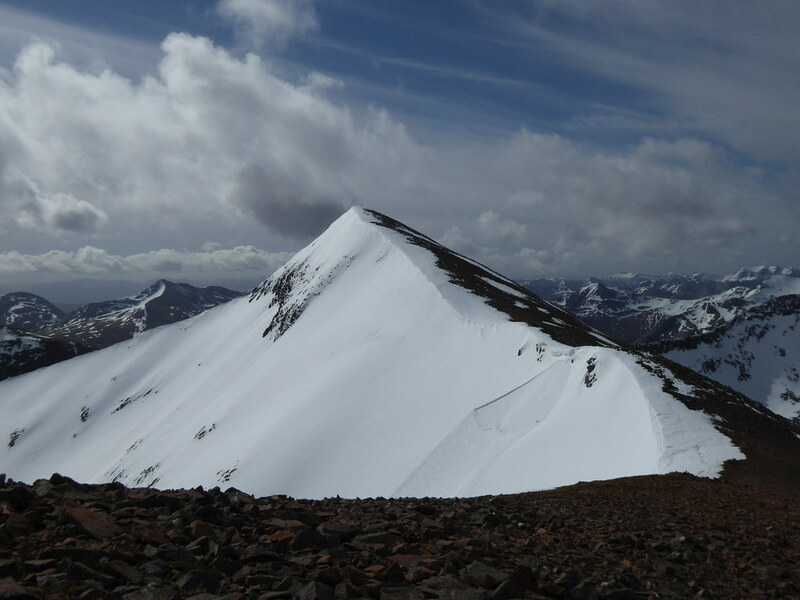 The true summit is not at the trig, but rather 55m away to the north east towards another cairn. Sellafield was obvious to the west. Seatallan is another Marilyn. I now just have one more Lake District Marilyn to do. I also saw my first people since cutting across country via Low Tarn. But considering the weather, it was hardly heaving – they were three in number. It was time to move on. We followed our route up back down to the col. It was quite wet but a path up the north ridge of Middle Fell could be seen from afar. 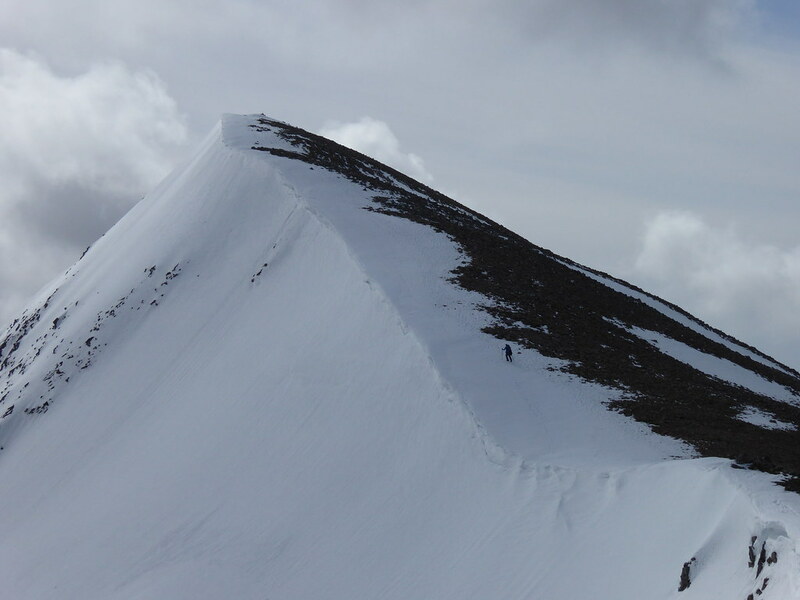 It is about a kilometre up the easy angled ridge. Things were becoming busier. A family group of eight passed me. On the top there was a single man and slightly below a couple were sunbathing. Wastwater had come back into view. And Sellafield could still be seen. 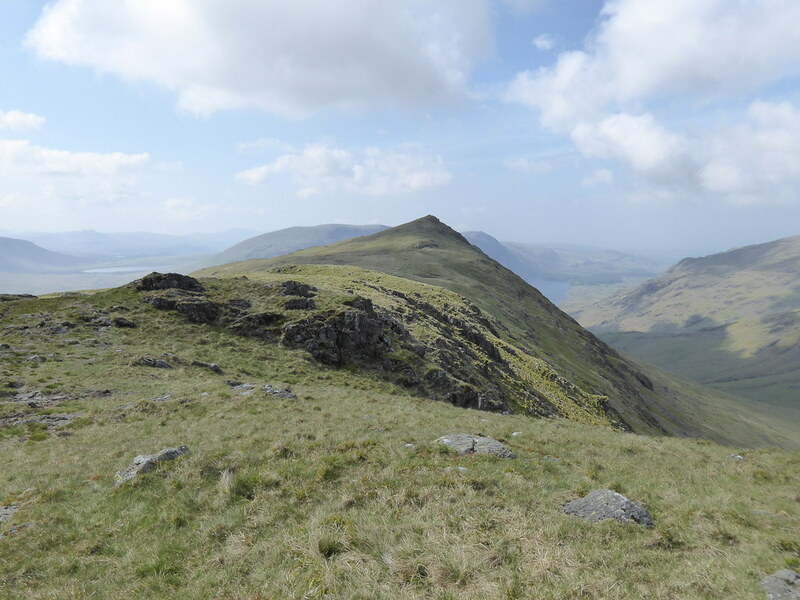 The final top that I was aiming for was Buckbarrow, some 2.5k away – a Wainwright I thought I may as well do since I was in the area. 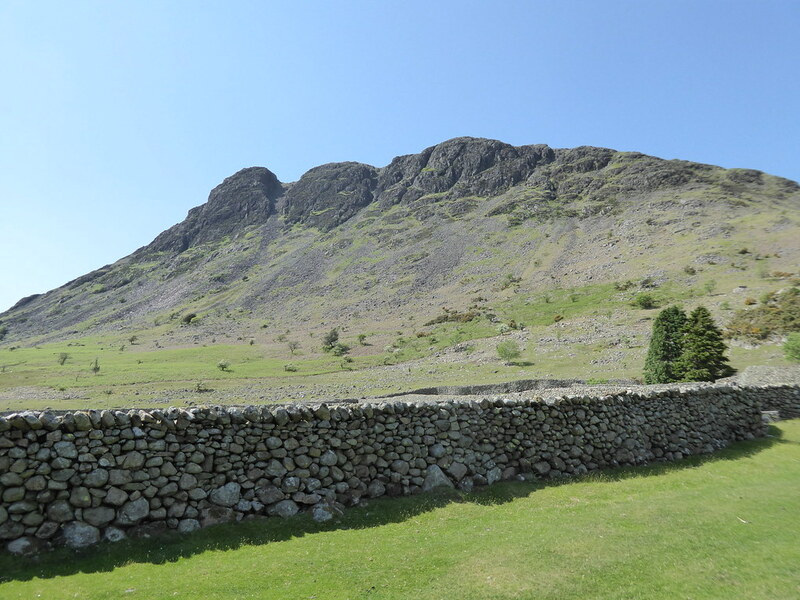 Buckbarrow has no significant prominence and is really only an appendage of Seatallan. 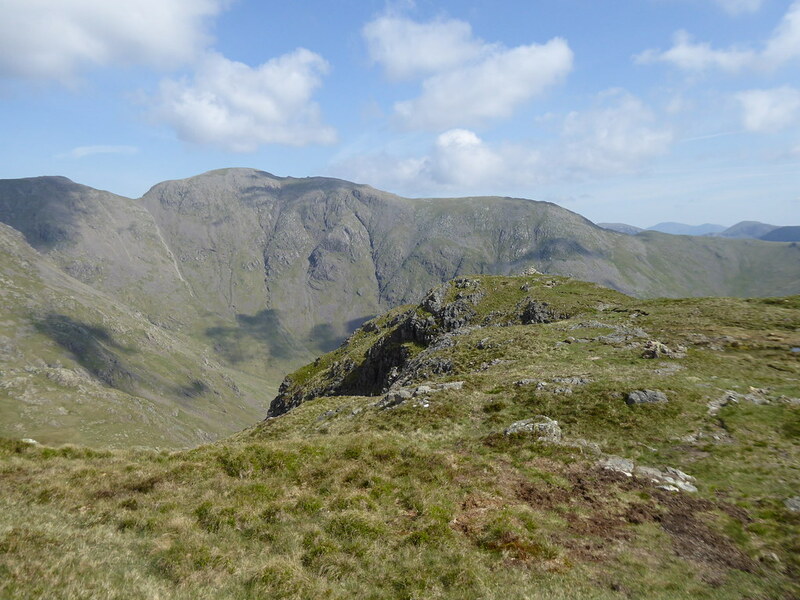 I found a direct, if slightly unsatisfactory, way off Middle Fell by walking south for 100m or so and then just bailing off down the western slopes. The ground was a little more broken than the map indicated. But we safely made our way down to Greendale Gill. I stopped to let Jet have a drink. 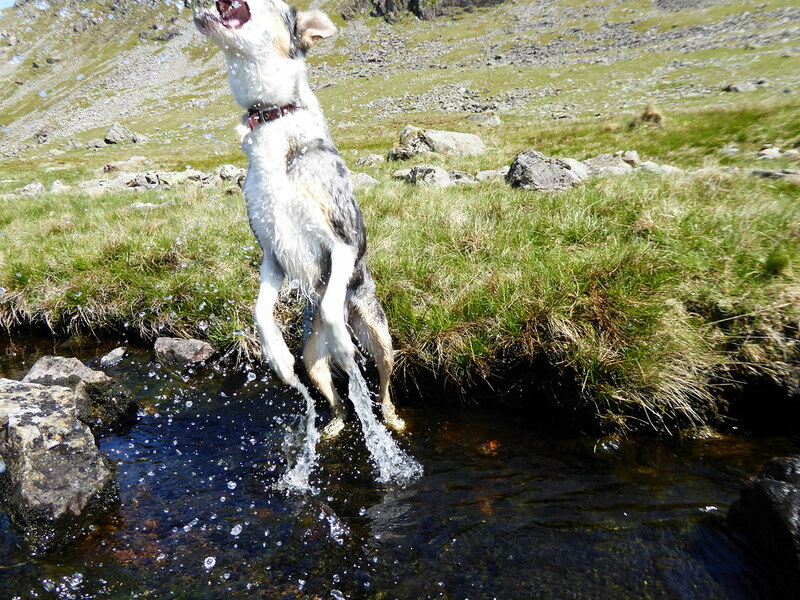 I then started flicking water into the air from the stream and Jet (as is his wont) decided to try to catch it. 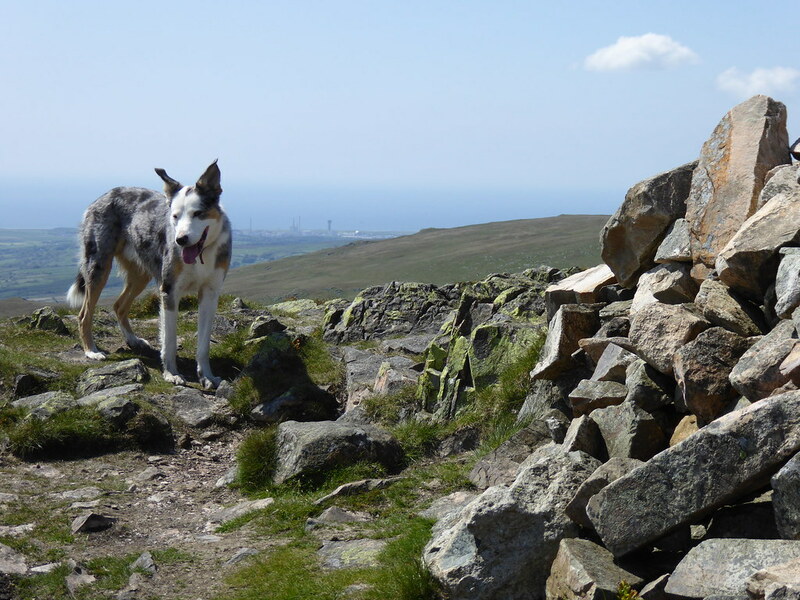 That fun over, we went south west over the expanse of moor. 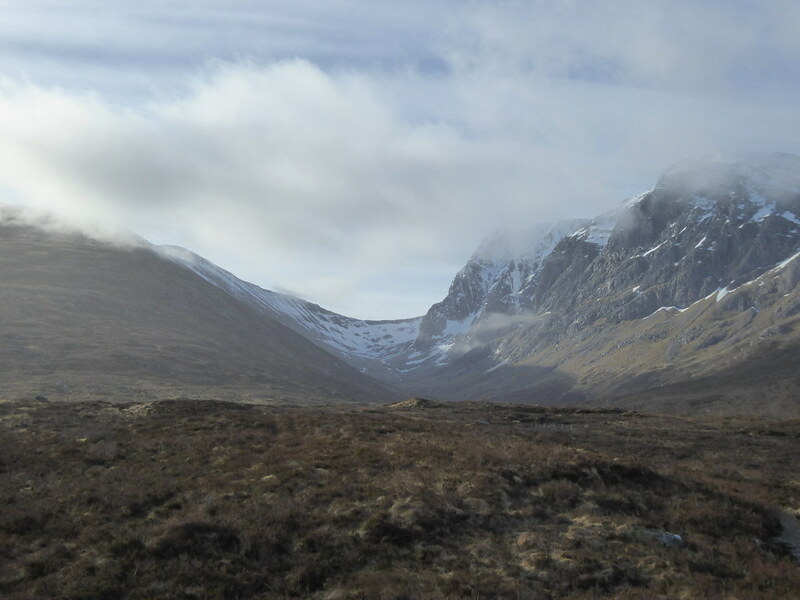 Soon, in the distance, I could see what looked to be a rock or cairn sticking up. I made my way up to it. 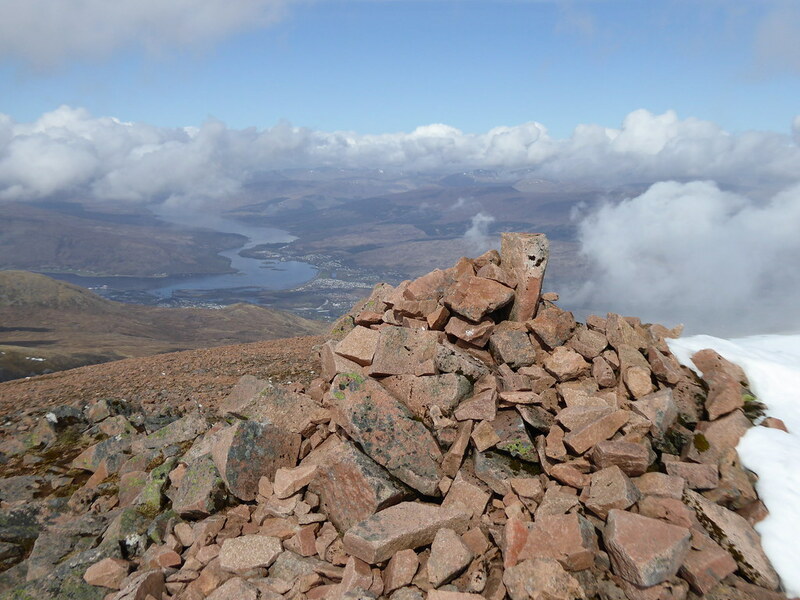 It was a cairn. It seemingly marked no particular point and was not marked on my (admittedly) old map. It was obviously well constructed. I found out later that it had been built by Joss Naylor as a cairn to mark the death of the Queen Mother. 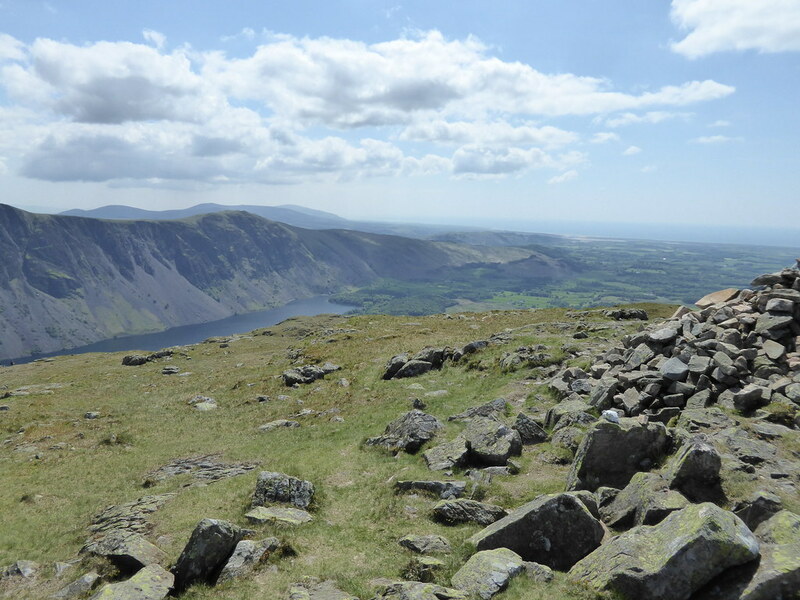 So it was on to Buckbarrow which has a view of the screes but Wastwater is a little shy from this spot. We did not stay long. And so we went slightly north of west to Tongues Gills. There is a path here (not marked on the map) that leads you down to Greendale Gill and the continuation of the bridleway that we had crossed over en route to Seatallan. We followed the bridleway down to the valley bottom and could look back up to the crags of Buckbarrow. From there it was a walk along the road down to the Lake and then 2.5k on the road along the Lake itself. The place was now very busy and people had filled up most of the parking and picnic sites. Barbecues were being had, photos were being taken, sunbathing was being indulged in etc etc. 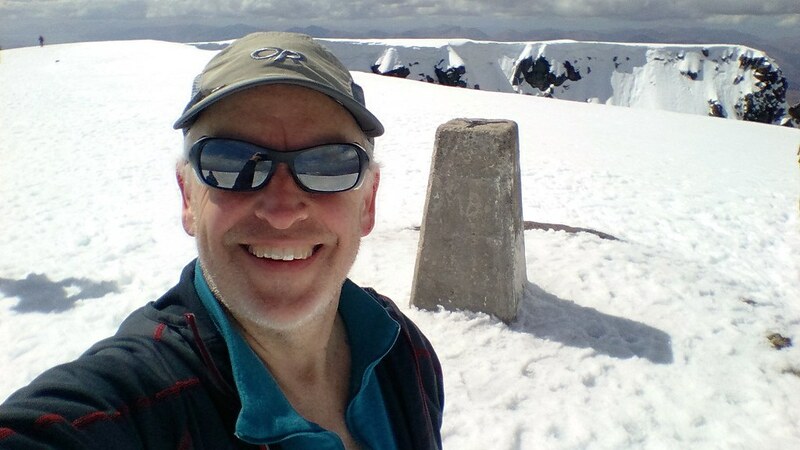 Back to the reality of the Lakes on a sunny day in late Spring! Beamsley Beacon is a well known landmark near Bolton Abbey and a prominent feature above the Wharfe valley. Round Hill is higher but less obvious except, perhaps, when view from the east as one approaches Blubberhouses Moor. I had been up Beamsley Beacon a few times but had never made my way on to Round Hill. So today was the time to rectify that. Both Beamsley Beacon and nearby Old Pike have large Bronze Age mounds, probably used as burial chambers. There is a parking area on the minor road to the west of Beamsley Beacon where we parked. 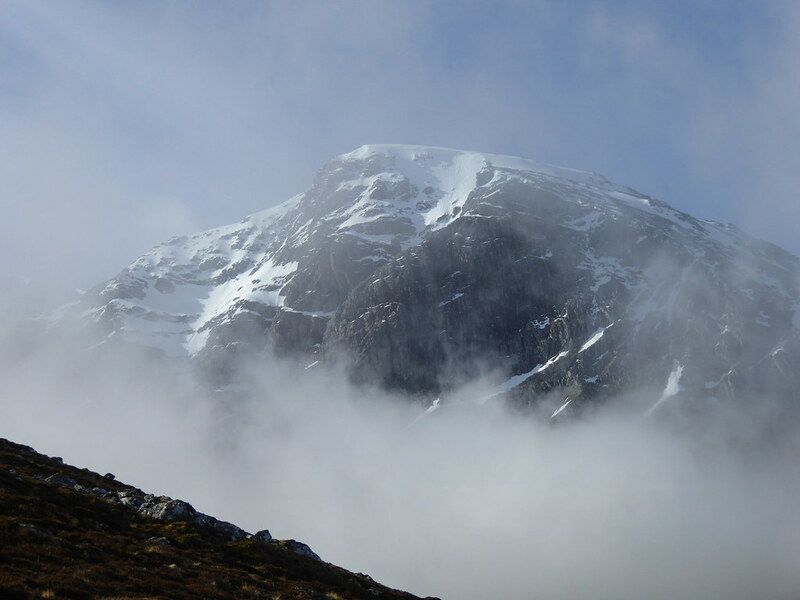 It is a short 750m horizontal and 150m vertical to the top. Old Pike is another 400m further. Strangely the public footpath ends here but there is a permissive path across the bleak moor with Round Hill only slowly coming nearer on the trudge across. Here I was walking along the boundary of the Yorkshire Dales National Park. In a couple of places there are boundary markers. It is straightforward if occasionally wet. We were overtaken by 3 fell runners. We came to a wall with a pedestrian and a vehicular gate. Here a bridleway passes north to south. This was the view west back the way we had come. 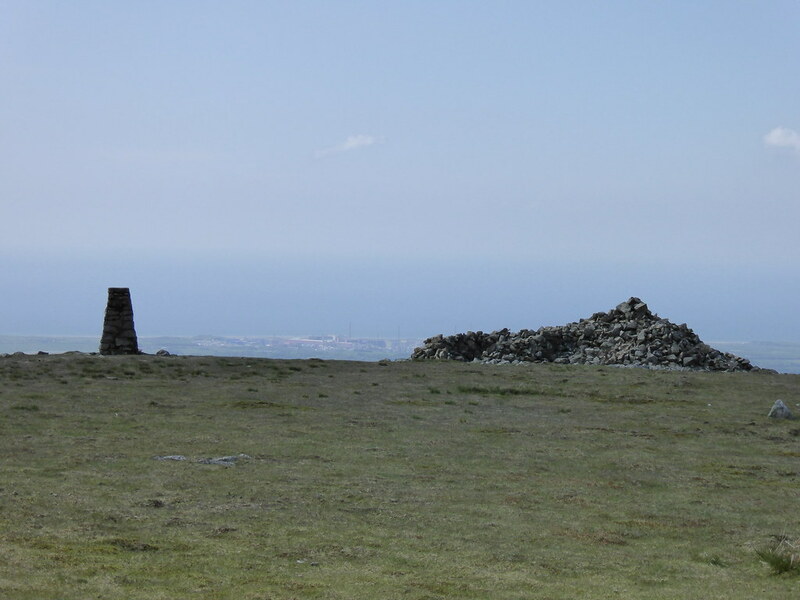 The summit is at a small pile of stones with a view of the golf balls of Menwith Hill and the very distant North Yorks Moors. To the north was a vast expanse of moorland including Simon’s Seat. To the south were hints of urban areas plus Ilkley Moor and The Chevin. We followed the bridleway south across Middleton Moor Enclosure and then followed a line of grouse butts back to Old Pike and then over Beamsley Beacon back to the car. That took just over two hours for the round. 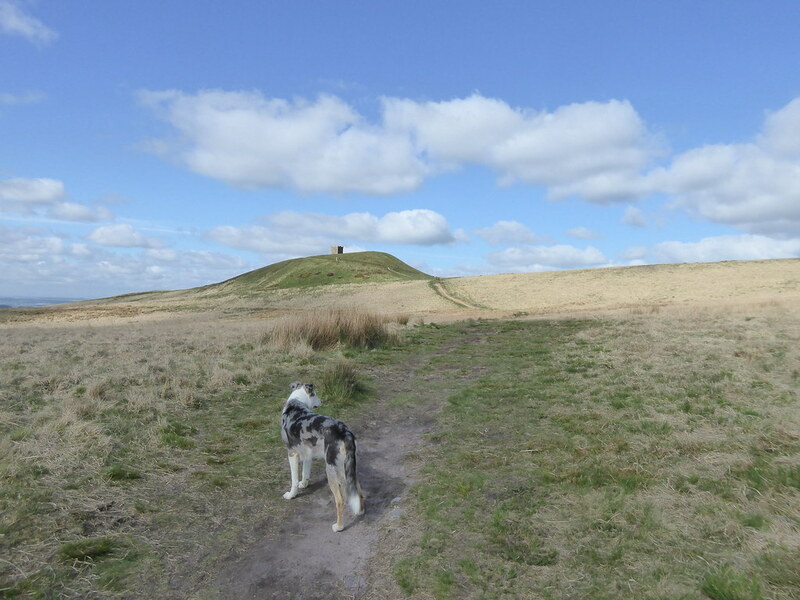 This is a short post on my climb up these two hills – though “climb” is perhaps a bit of a misnomer for Billinge Hill. I used the opportunity following dropping Julie off at Manchester Airport for her Australian adventure to visit some hills a few hours away from home. 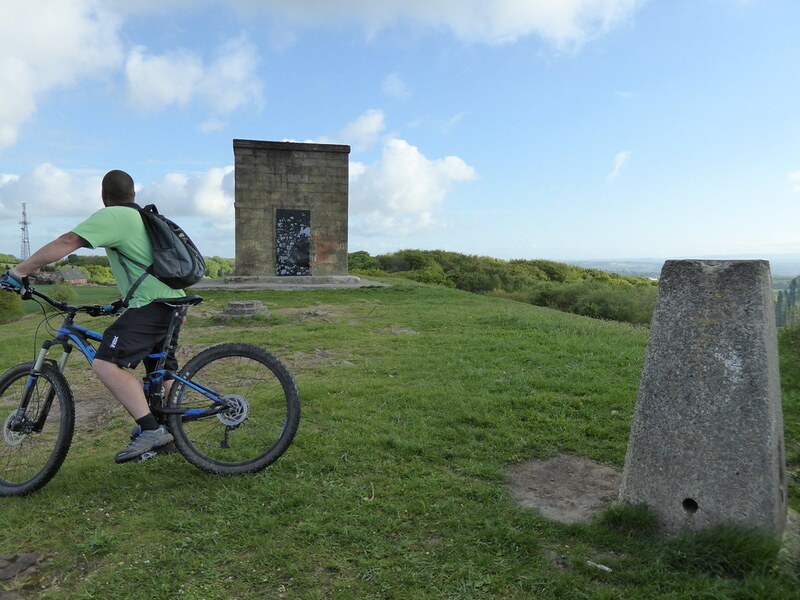 Billinge Hill is a Marilyn and also the highest point of St Helen’s Unitary Authority and of the County of Merseyside. I was able to park about 500m from the top and there was a pleasant stroll with Jet along the public footpath on the edge of a field with a golf course on the other side of a hedge. Although it is not strictly a public right of way, the farmer has cleared a track across the field to enable access to a tower and trig point at the top. There are extensive views out to the south west over St Helens and Wigan. Apparently Snowdonia and Blackpool Tower can be but not today. 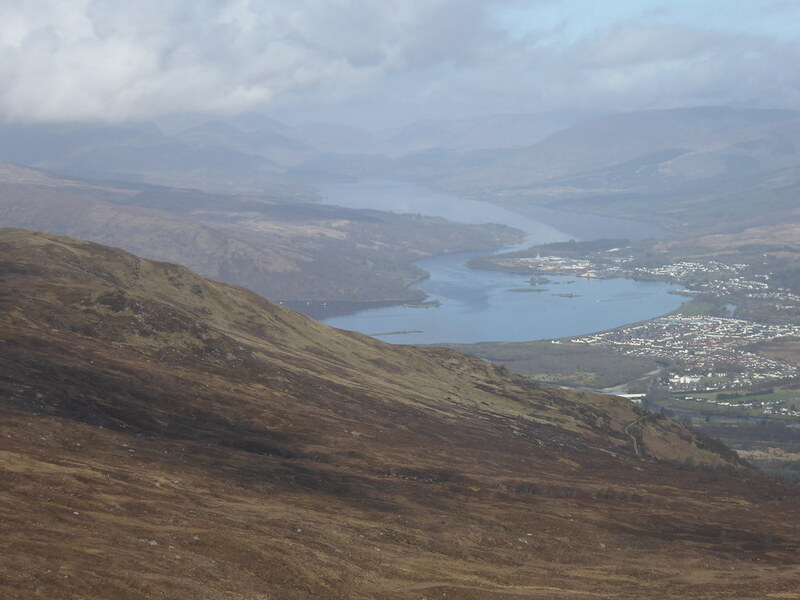 But in other directions the views are relatively limited, other than to the Pennines to the east and the sprawl of Manchester to the south east. 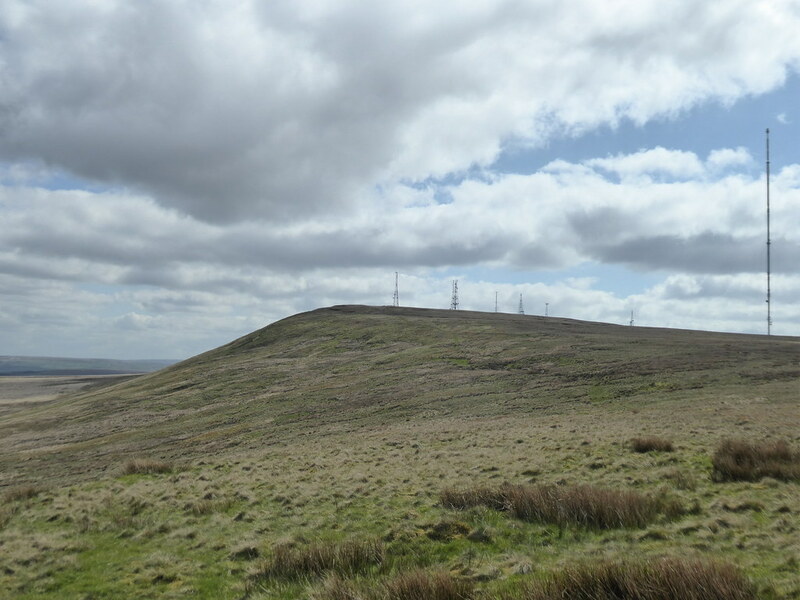 Winter Hill, my next target, could be seen peaking over the foreground. There are a number of communications masts nearby. The tower was built in the 18th century and is little worse for wear. A guy on a mountain bike came up as we were there. We had a brief chat. He was on his usual early morning circuit. Jet and I then returned to the road. As the high point of Wigan Unitary Authority was only ten minutes’ walk away, I decided to go there. It was a rather uninspiring corner of a wet field with very little prominence – so no photo. We then drove the short distance to Winter Hill. The start point was Rivington Hall, now owned by the local authority. Further up the valley to the north there are a series of reservoirs created by flooding the valley in the 1850s onwards. There is plenty of parking here and, being a weekend, it was fairly busy. 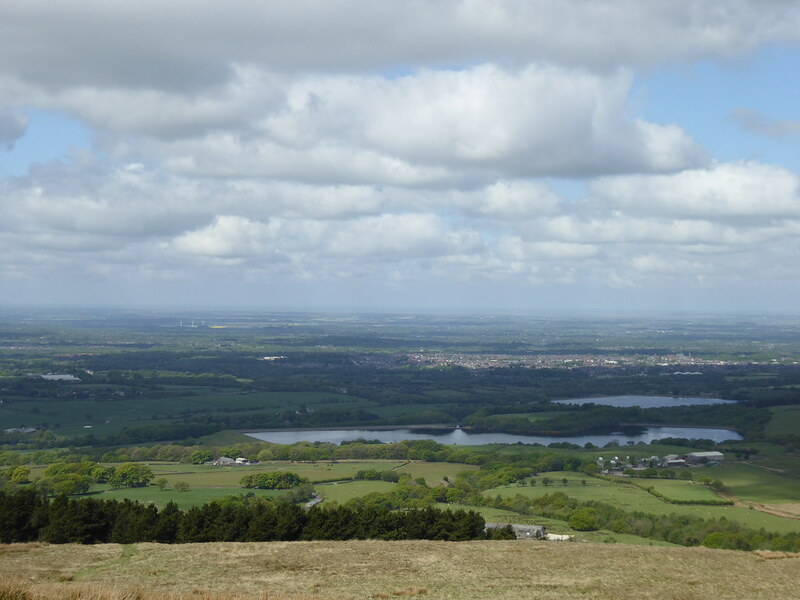 My first objective was Rivington Pike, the site of another tower and beacon. 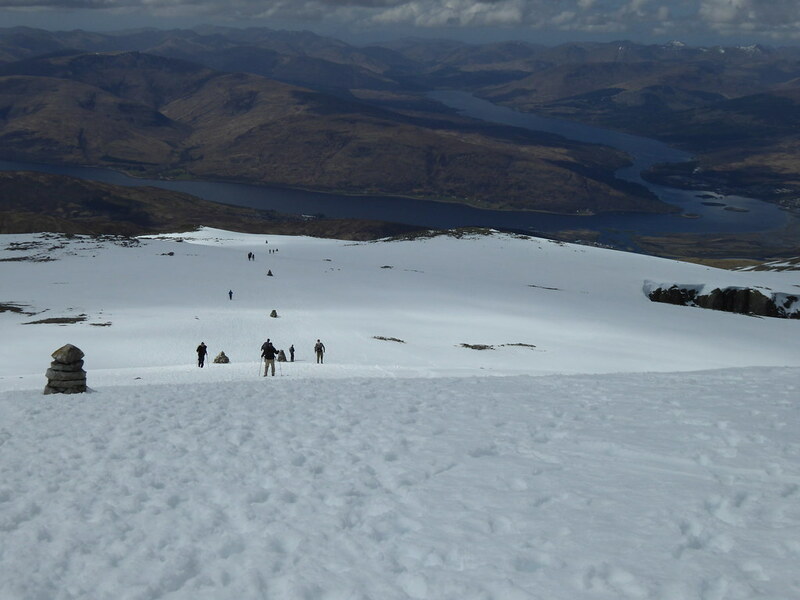 The climb was steep and wound its way up paths through woodland and terraced gardens that had seen better days. Emerging from the trees, the tower on the Pike could be seen. A rough road that runs just below the 300m contour is crossed before the final steep climb. The tower dates back to 1733 and is in slightly better condition than that on Billinge Hill, but the door and windows are blocked up. It was originally a hunting lodge. 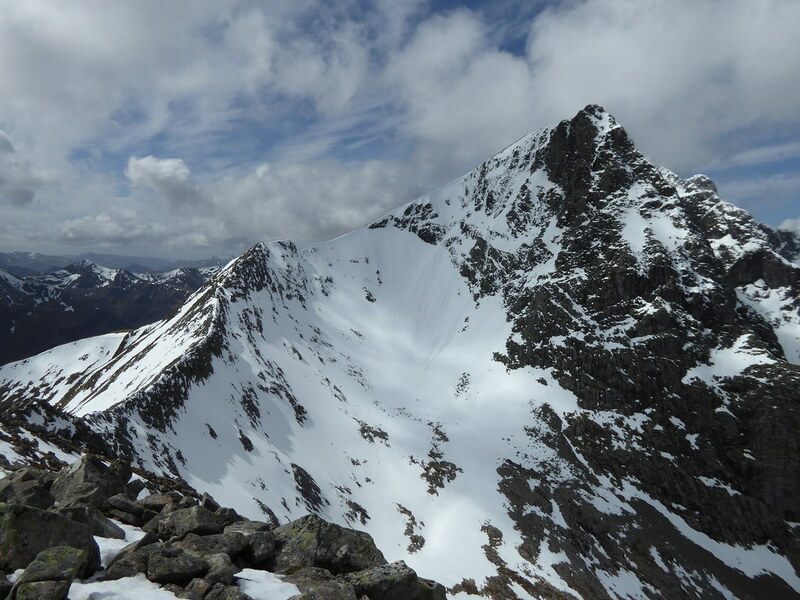 The Pike is at 1,193ft (363m). Being the site of a beacon there is a grand view. 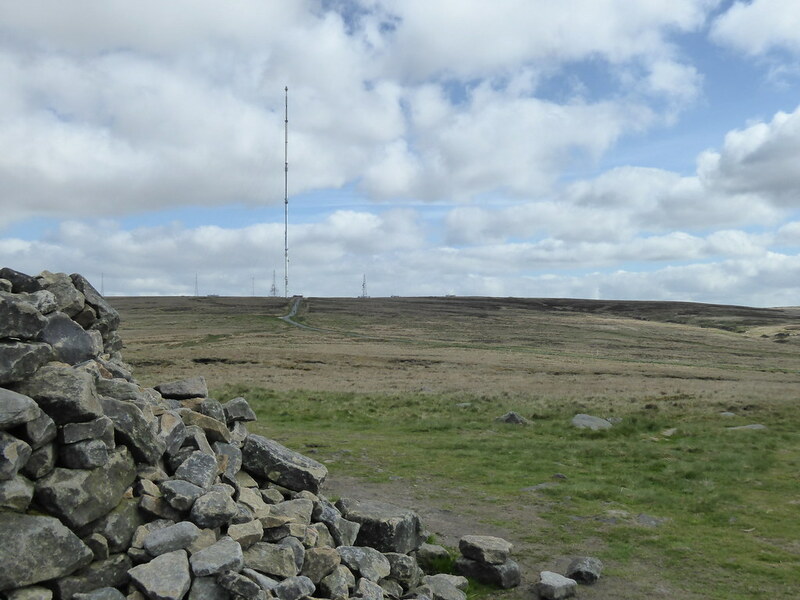 To the east is an expanse of gently rising moorland leading to the top of Winter Hill. This is Rivington Moor. I was going to circumnavigate this in an anti-clockwise direction. To the west the reservoirs can be seen nearby and beyond lies the Lancashire Plain and the conurbations of Wigan and Bolton and, further away still, Manchester. 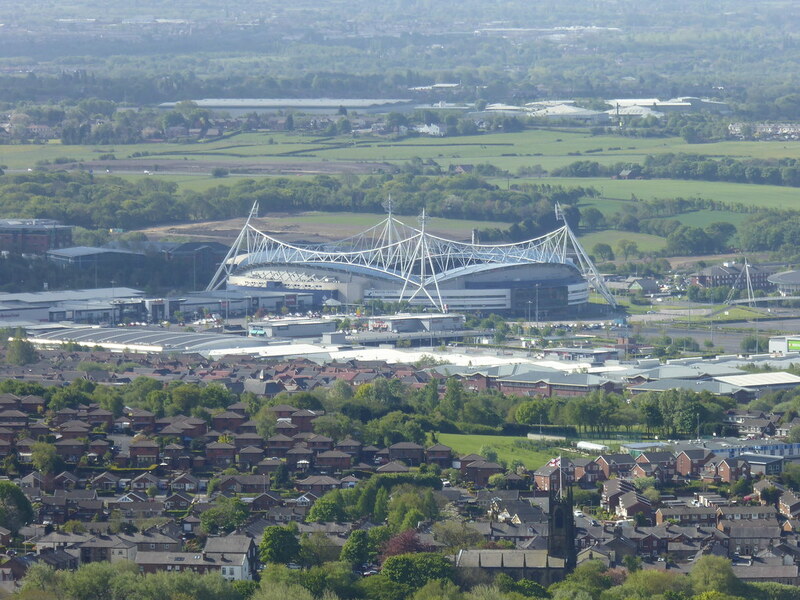 The Bolton Wanderers stadium could even be seen! I briefly had the top to myself. But, like the car park below, there were plenty of people about. Many were fell runners. I wish I had the energy and strength! The next destination was the intriguingly named, Two Lads. This lies 1.5k away to the south east and can be reached either by returning to the rough road or more directly across the moor. I chose the latter. 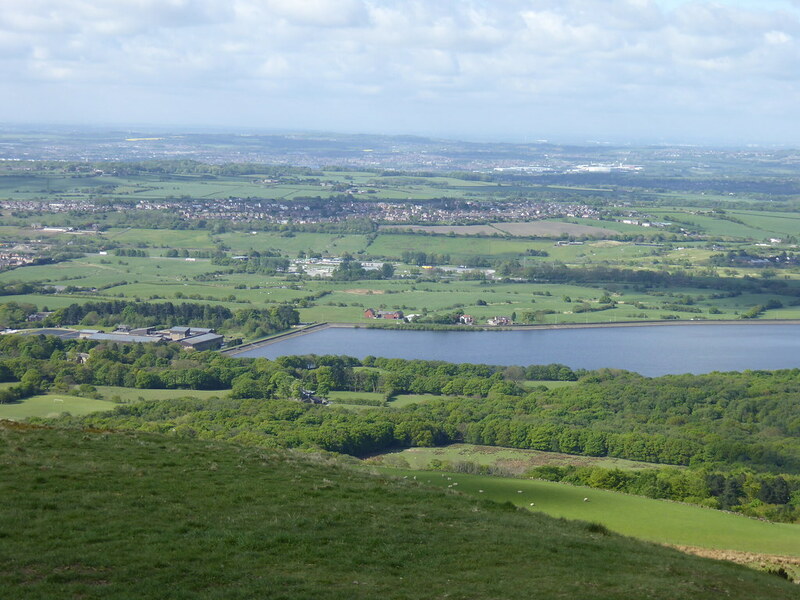 Here is a look back to Rivington Pike. This route could be quite a wet alternative after rain. 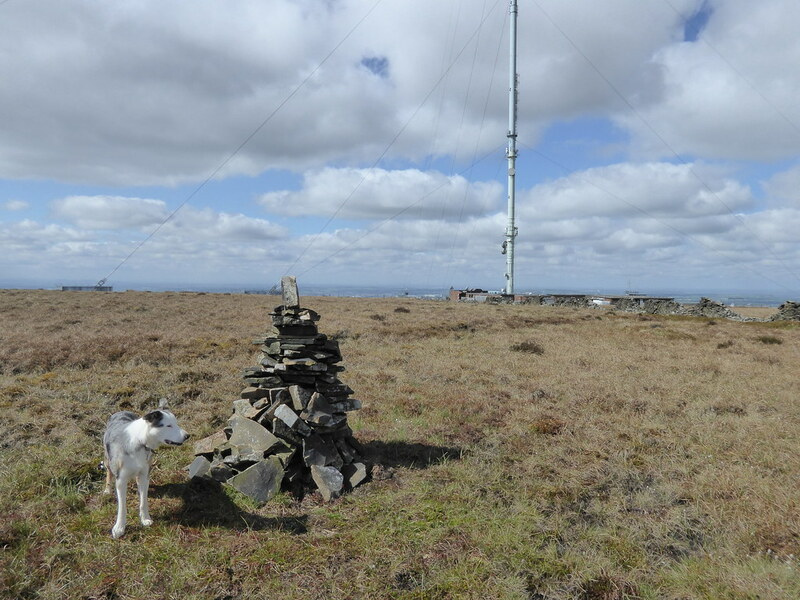 Two Lads is a feature at the south east corner of Rivington Moor sporting a couple of cairns. 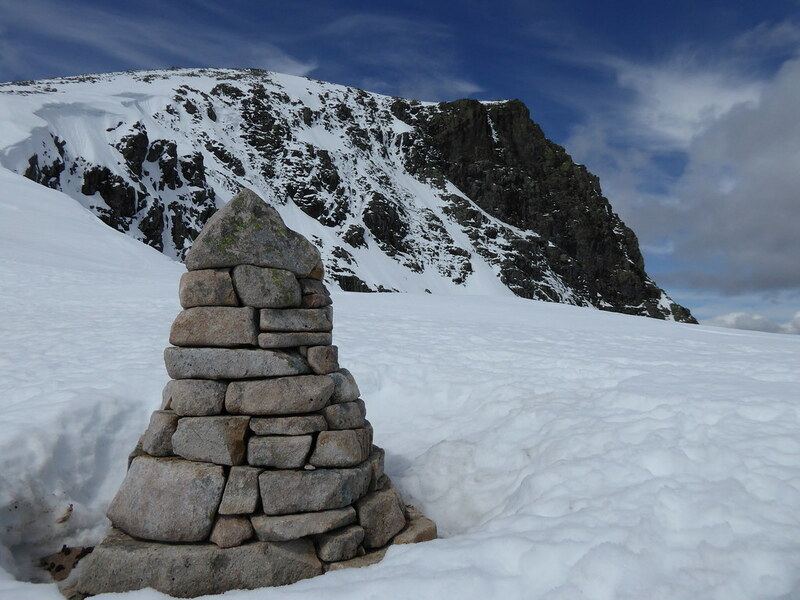 According to one story the cairns mark the spot where two children of a Saxon king lost their lives in inclement weather. The views are similar to those on the Pike. 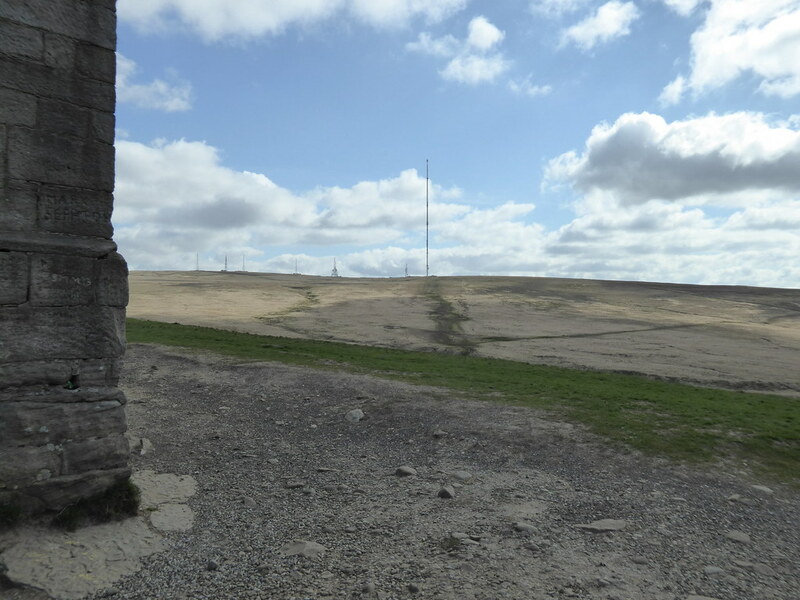 The way on becomes more straightforward once the service road to the masts that litter the summit of Winter Hill is reached. More fell runners and mountain bikers were encountered along this stretch. 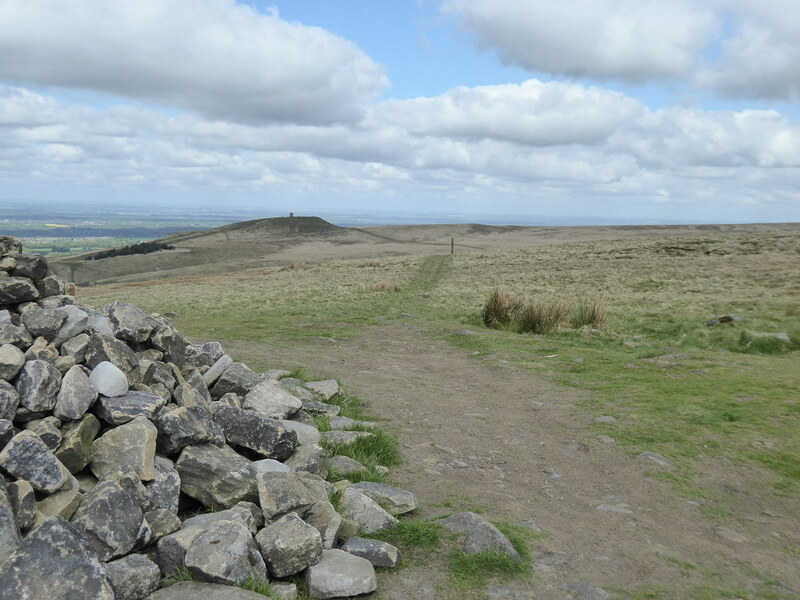 The summit of Winter Hill was a further 1.5k away. It marks the high point of Blackburn with Darwen MBC. 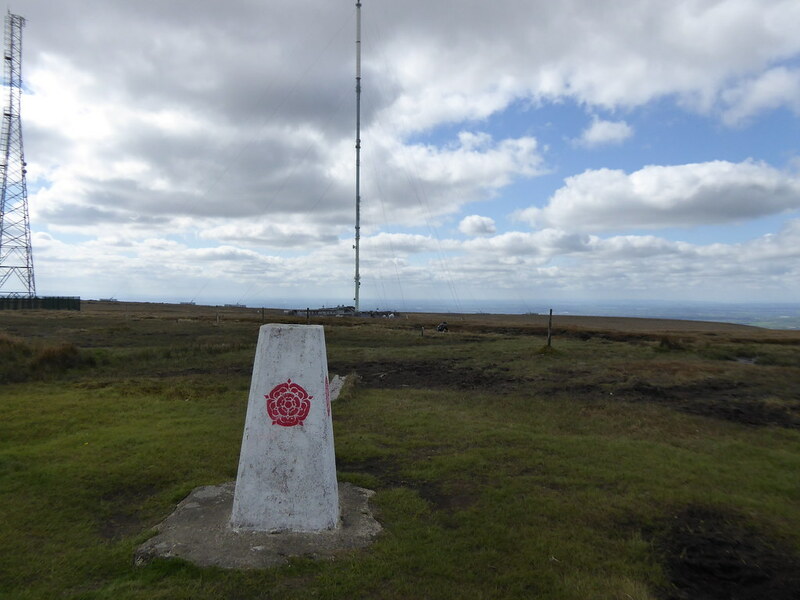 But before then I took a slight detour to a point a little over 400m south east of the summit trig point to visit the high point of the Metropolitan Borough of Bolton! 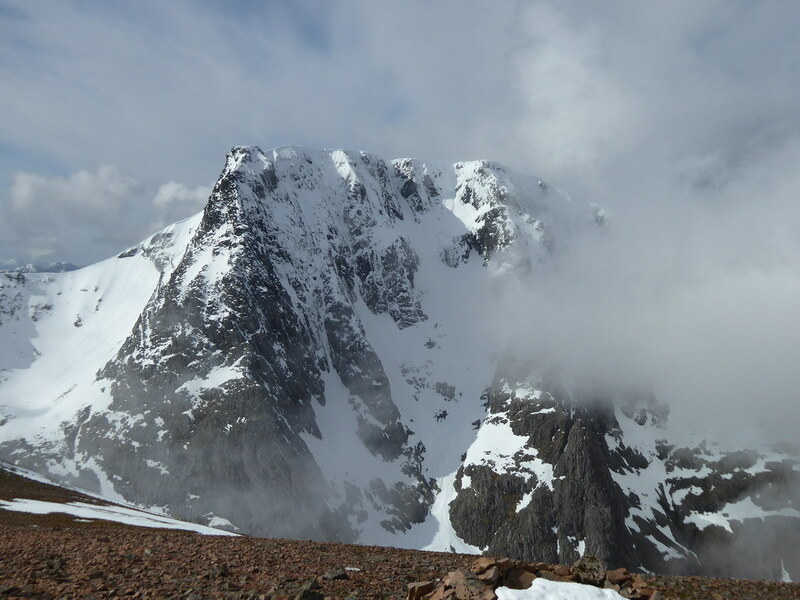 This is marked by a cairn on an imperceptible rise. You wouldn’t bother unless you were in the area anyway! Nearby is this memorial plaque. 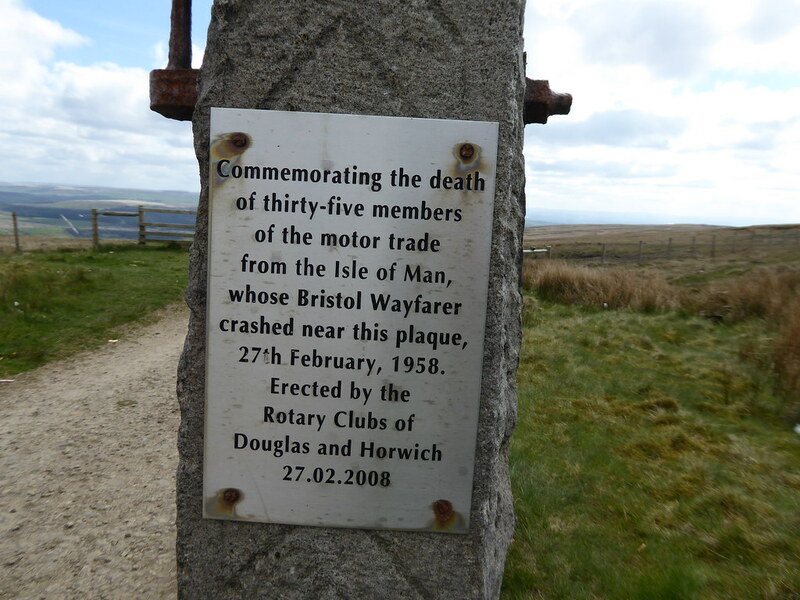 Apparently the weather at the time of this crash was so severe that no-one working in the nearby transmitter station was aware that it had occurred. 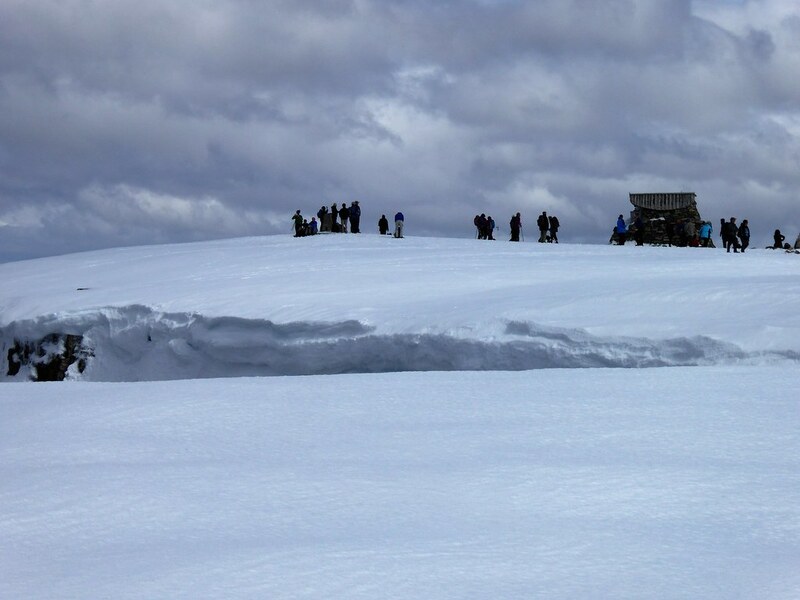 Winter Hill has a bit of a reputation for being a magnet for aircraft mishaps with at least 10 other crashes having been recorded on the hill or nearby. 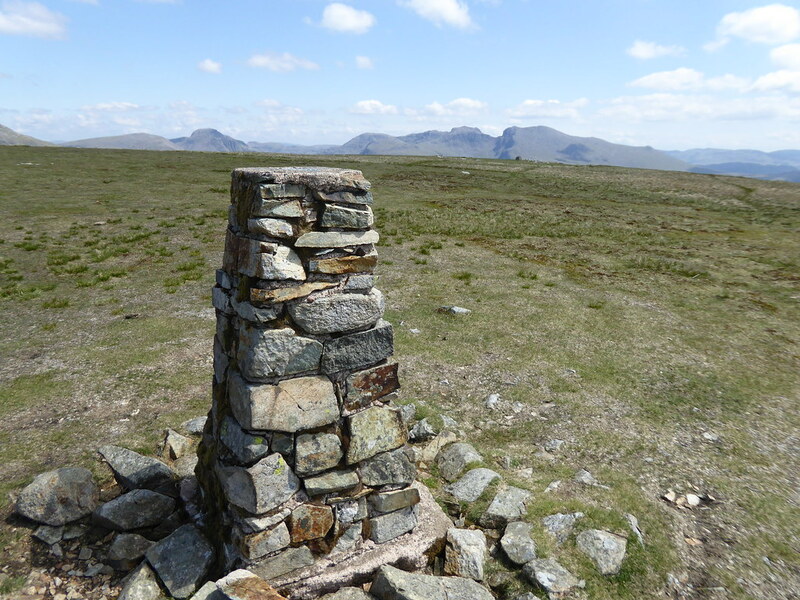 It was obviously time to move on and the trig point leaves you in no doubt as to the county you are in. I was now on the northern edge of the moor. Here it falls away in steeper slopes, quite a contrast to the gentle slopes to the south seen here with Rivington Pike in the centre. The distant Yorkshire Dales can be made out to the north. A chill breeze was blowing so I did not stay long. Another couple of mountain bikers cycled by. 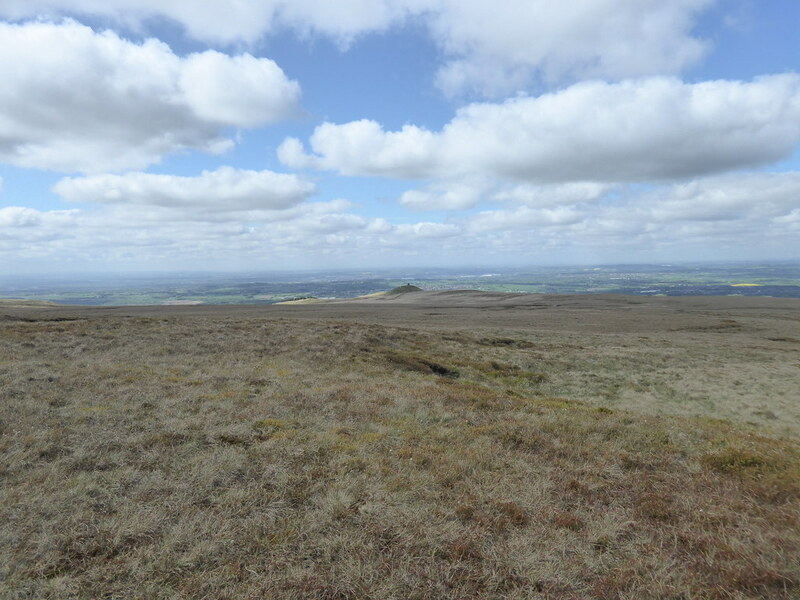 The next objective was Noon Hill at the north western edge of the moor. This is a far less frequented section. Although there was an eroded track it was very boggy. So some hopping over wet ground was needed. 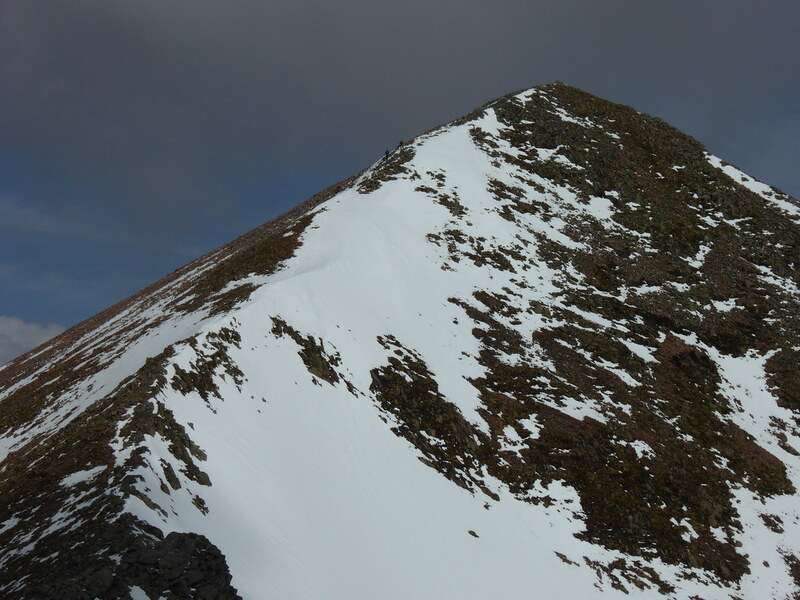 Although it is described as a “hill”, Noon Hill has no real prominence. It is of archaeological interest though as the summit of Noon Hill is home to a protected Bronze Age burial mound. There is another such mound near to and to the west of Winter Hill itself. Here is the view back to the top of Winter Hill. 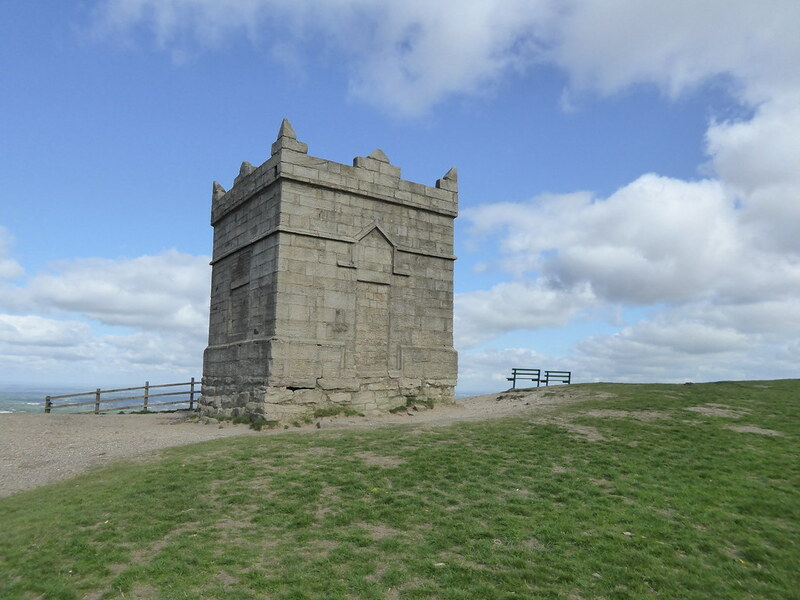 This is the Pigeon Tower, a folly used as a dovecote and a part of the Rivington terraced gardens. 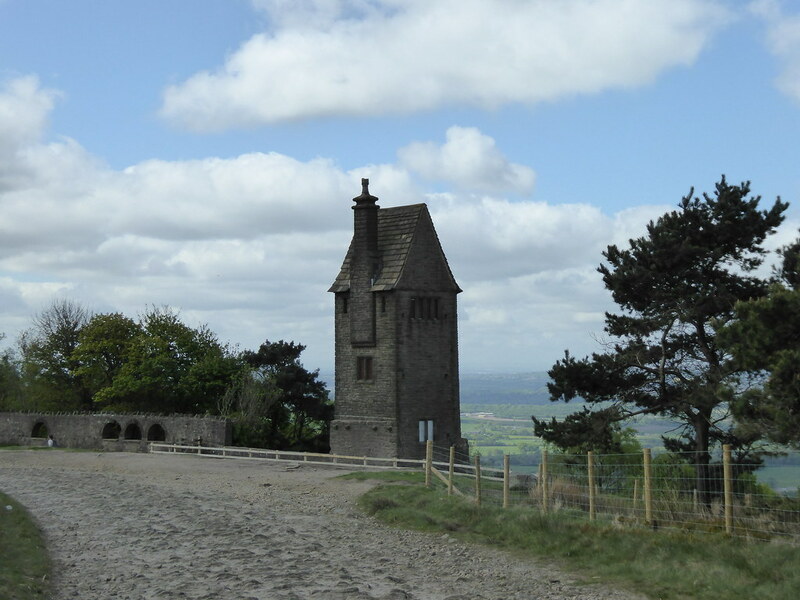 There is a speedy, if steep, way down to the car park near Rivington Hall by the side of this tower. This walk was an enjoyable one with a number of points of interest in a part of the country I would not normally frequent. Thank goodness for Marilyns!